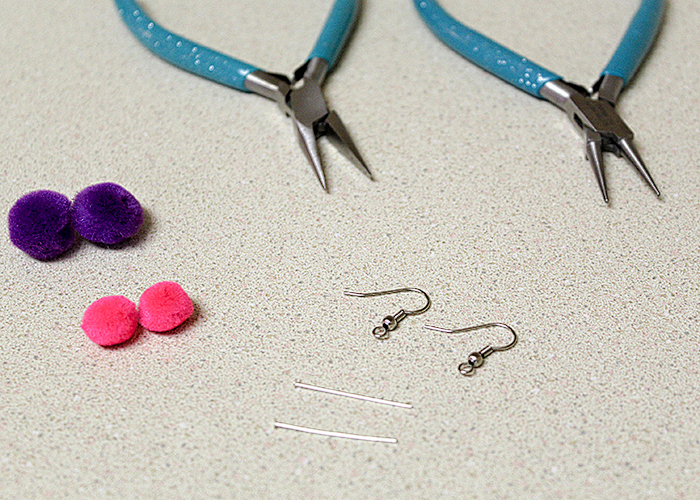 This may be one of the easiest jewelry tutorials you’ve ever read, and it really is! 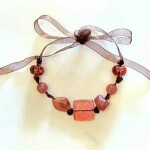 My little girls love cute jewelry, and that adds up quick! 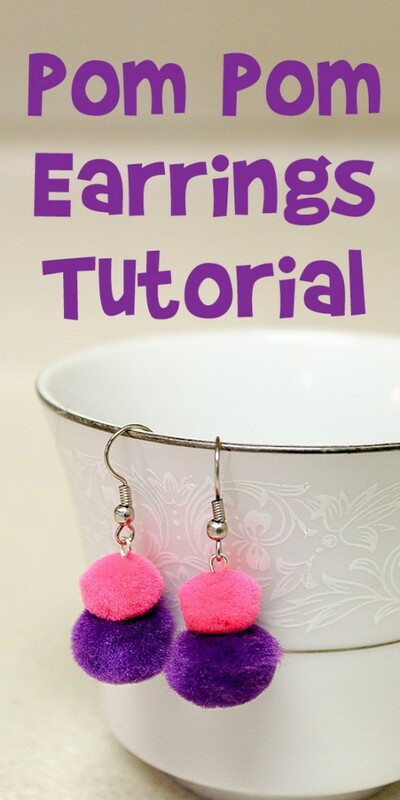 Here’s how to make a pair of cute pom pom earrings that your kids will love, and you can make them multiple pairs for the less than the price of one store bought pair. Plus, if they’re over the age of 7 or so, they can make them by themselves! Pom Poms. I recommend getting a mixed bag so you have a good choice of colors and sizes. 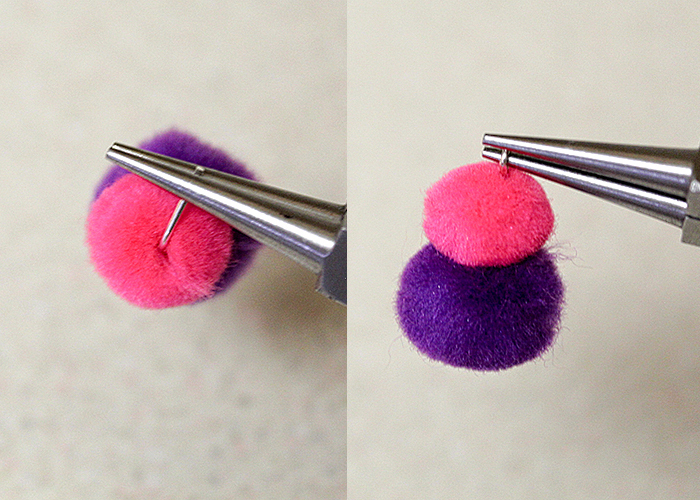 Take one of the head pins, and push it through the center of your larger pom pom. Slide it down to the bottom carefully. 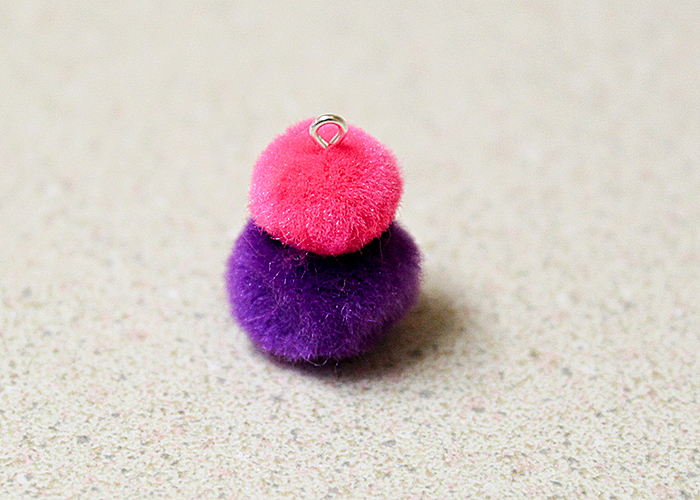 If the head pin slips all the way through, your pom poms aren’t very dense and it may need a dot of glue on the bottom to stay in place. 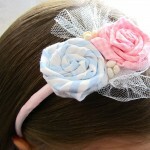 Most pom poms will stay on the head pins just fine without glue though. 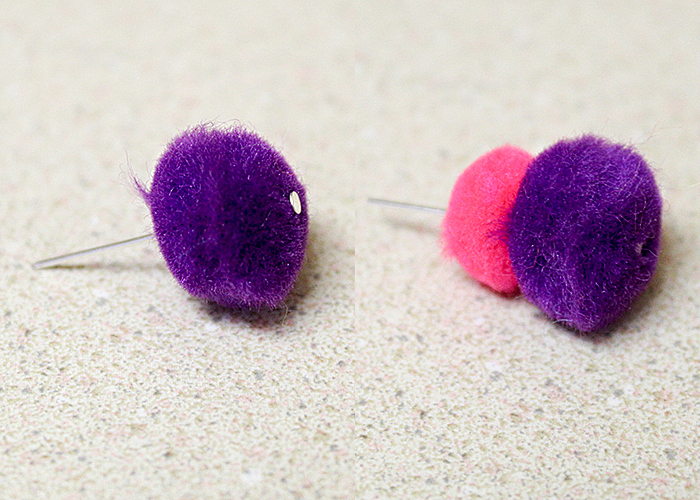 Take your smaller pom pom and slide it on the head pin on top of the larger one. 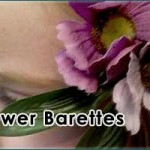 Make sure you have about a centimeter of head pin left at the top. 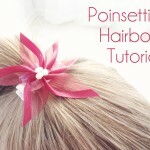 Take your needle nose pliers and place the on the head pin at the top of the pom poms. Bend the pin at a 90 degree angle. Take your round nose pliers, and take a hold of the pin at the very end. 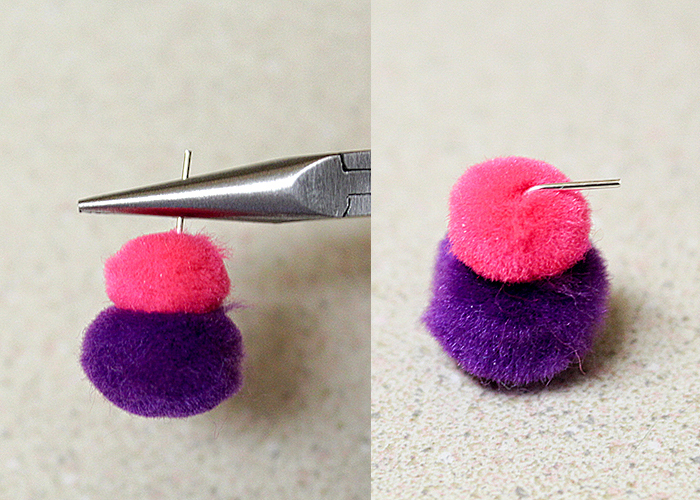 Roll the pliers around, up and inward to create a loop on top of the pom poms. 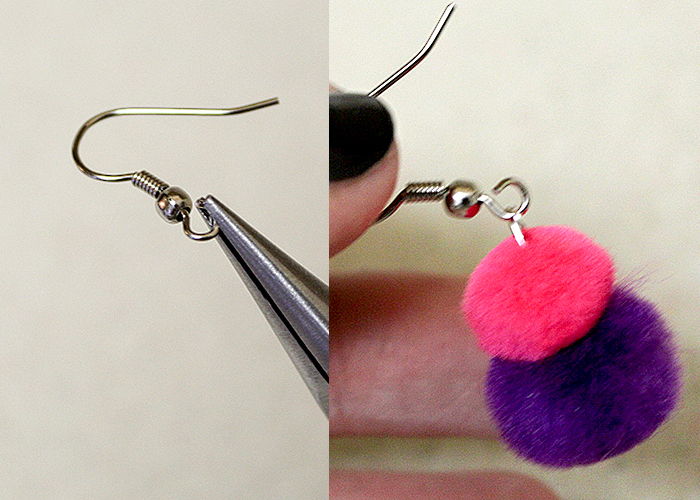 Next take your earring wire and gently open the bottom loop with your needle nose pliers. 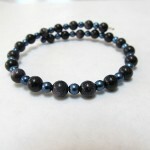 You want to twist it towards you, not pull it out, so you don’t distort the shape of the loop. Then insert the loop of your head pin, and close the earring wire loop back up. You’re all done! Just make a second one so you have a pair. 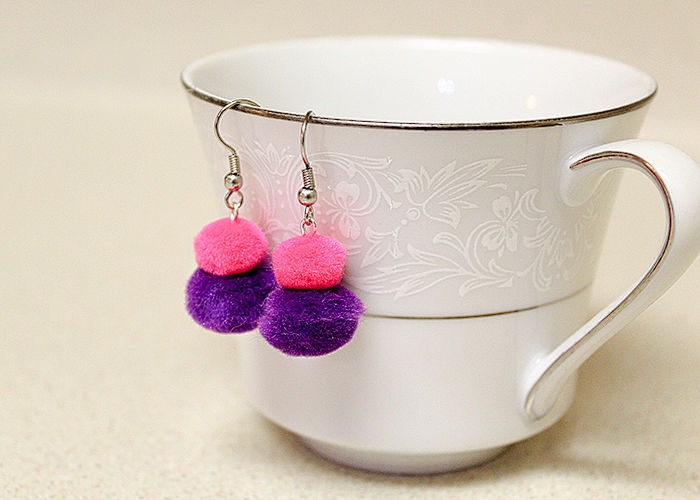 I hope you have fun making these pom pom earrings!